Ferrous and non-ferrous producers around the globe depend on Butech Bliss because we offer some of the most experienced engineering minds anywhere. Butech Bliss offers both trouble-shooting and engineering expertise. Replacement parts are available for all Butech Bliss equipment dating back to the 1920’s. Even obsolete parts or replacements needed for non-Butech Bliss mills are challenges easily met by our engineering group. Our customers have learned from experience that Butech Bliss is the answer to all replacement parts needs. The modern hot strip mill is furnished with a tremendous amount of equipment from the reheat furnaces all the way down to the coiling equipment. Fortunately for both our ferrous and non-ferrous customers alike Butech Bliss can provide equipment and technical services for nearly every element of the hot strip mill. Butech Bliss has been successful in reconditioning, modernizing or replacement of mill roller table, centering guides, roughing mill stands, hot mill shears, finishing mill stands, coiling equipment and material handling equipment. Typical upgrades to hot mill stands include the addition of roll bending for profile and shape control as well as the installation of hydraulic roll force systems for automatic gauge control. Customers are also looking to see production improvements by eliminating mill down time through shorter roll changes. This may be accomplished by modernizing the mill window and incorporating quick work and in some cases back-up roll change schemes. Butech Bliss also offers high response hydraulic loopers for our ferrous customers who are looking to replace older inefficient electro-mechanical systems for interstand tension control on their finishing stands. In recent years Butech Bliss has been particularly active with hot strip Downcoilers for our ferrous customers and hot mill shears for both the ferrous and non ferrous industry. Butech Bliss has a long history of proven concepts in hot strip Downcoilers. We were the first to provide a coiler with an expanding mandrel! Years ago, we developed the patented two-slide, four-roll coiler which by its rugged design opened up new markets for many of our customers. Today Butech Bliss offers our latest design which includes hydraulically actuated wrapper arms with an automatic “Jump” control feature and quick-pivot outboard bearing support. Our most recent coiler installation was designed for heavy gauge, high strength pipe grade material while including these latest design features. Butech Bliss has also been very active in working with customers to upgrade their existing downcoilers. In some cases older coilers may be redesigned to produce customer’s desired product mix at a significant savings over the cost of a new coiler. In its long history Butech Bliss has literally sold hundreds of shears to the metals industry. Recently Butech Bliss has been called upon to provide large, robust hot mill shears for very demanding applications in the aluminum, steel and special metals industries. 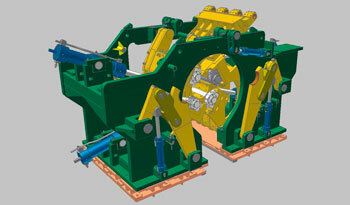 One of these recent shears installed in Europe is likely the largest hot mill shear in the world. This crank type rotary shear, designed to process heavy pipe grade material on the fly weighed in at over one million pounds! When looking for a new hot mill shear, it’s important to remember that Butech Bliss shears are always “A cut above the rest”! From a new single stand reversing cold mill to a complete revamp of a multi-stand mill, Butech Bliss delivers. We specialize in the evaluation of existing mill stands and the necessary reconditioning of the same for use in other applications. In recent years, Butech Bliss has modernized more than 50 single stand mills and 35 multi-stand mills. Plus, our engineering capacity combined with one of the largest mill manufacturing facilities in North America means projects are completed on time, under one roof. Typical mill upgrades include items to improve product quality or mill productivity. These items often include shape and gauge control system upgrades, the addition of modern roll change systems and new or upgraded drive capabilities. Whether you are looking for a new mill or you want to upgrade an existing facility, Butech Bliss has the answer for your next single stand, or tandem mill project. The Butech Bliss temper or skin pass mill solution uses the trusted Bliss technology supplied to mills throughout the world. Whether your objectives are to suppress yield point extension, improve flatness or improve surface condition, Butech Bliss has the mill for the task. Having provided over 70 temper/skin pass mills, Butech Bliss can assist customers in selecting the proper mill configuration; and size it specifically for the application. Butech Bliss can provide mills in two or four high roll configurations. Typical arrangements include reel to reel installations, in-line mills, combination reduction/temper mills as well as high speed two stand tin temper mills. Temper mill installations feature the reliable and fast acting Butech Bliss hydraulic roll force cylinders that are the industry standard. With more than 70 temper mills in our history, why not let Butech Bliss be your temper or skin pass mill supplier. With our depth of engineering experience, when it comes to hydraulic roll force equipment Butech Bliss has been and will continue to be the obvious choice for hydraulic roll force equipment. 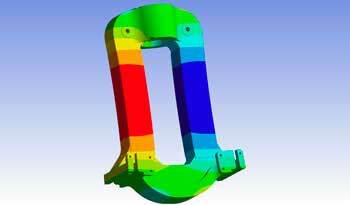 Butech Bliss began designing hydraulic roll force systems over 35 years ago. Initially we were replacing customer’s electro-mechanical screwdowns but today it is more common to replace early generation cylinders supplied by our competitors. Butech Bliss has provided more than 330 HGC cylinders in 75 installations, ferrous and non-ferrous applications, worldwide. Butech Bliss pioneered the “Tandem Piston” Roll Force Cylinder which paved the way for many single and multi-stand mill modernizations over the years. This commitment to roll force cylinder design also makes us the perfect supplier for roll force cylinder test and repair services. Reducing downtime and keeping mill operations at high production levels is critical in today’s competitive market. Butech Bliss offers an enhanced HAGC Cylinder Service Program (CSP) for rolling mill customers which includes regularly scheduled or on-call field service technician visits for hydraulic power unit inspection and fluid cleanliness testing. The program also provides one of the most complete multi-point inspection reports in the industry. A comprehensive repair history of each and every cylinder is maintained at the Butech Bliss Technology Center. Our goal at Butech Bliss is to deploy our engineering expertise in cylinder service and repair to ensure our customers maintain productivity and reduce rolling mill downtime. The HGC Cylinder Service Program is led by a team of engineers and assembly technicians who will fully build and test new cylinders, rebuild aged equipment, and service equipment in the field. The test center - housed at Butech Bliss’ wholly owned 400,000-square-foot technology center in Salem, Ohio - is equipped with a high pressure hydraulic power unit, a heavy-duty cylinder test stand and all necessary tooling to enable Butech Bliss to offer its customers comprehensive cylinder service for any and all roll force cylinders. Butech Bliss can also provide onsite support for the removal and installation of the roll force cylinders. Our newly reconditioned Hitachi Hyrop cylinder has arrived. Butech Bliss' service and assistance on expediting this in a timely manner is grealy appreciated. Your quality and service to meet our needs in this urgent situation is why we use vendors like Butech Bliss!! !